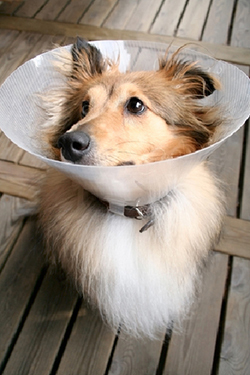 Your pet has undergone major surgery and is now being discharged for continued care at home. Your job during the recovery period at home is just as important as the surgical procedure just performed. What special instructions should I follow after my dog comes home? When your dog goes outside to go to the bathroom, it must be on a short leash and returned indoorsimmediately. You may only take your dog for very short, slow leash walks for 2 weeks, or as instructed by your veterinarian. "If your dog must be left alone, it must be confined to a cage." 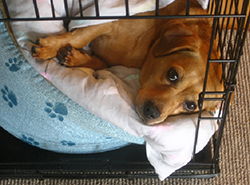 If your dog must be left alone, it must be confined to a cage or other small area that is warm and safe. This strict confinement and restriction of activity is necessary during the entire recuperative period. Excessive physical activity often leads to injury or serious complications. This means additional expense to you and added discomfort and risk for your dog. Do not bathe your dog or allow the incision to get wet. This also means that you cannot allow your dog to lick the incision at all. Monitor the incision daily for signs of redness, swelling, discharge or excessive licking. Mild redness and swelling are part of the healing process and should be expected for the first few days after surgery. After the first 2-3 days, the swelling and redness should subside and the incision should look better each day. Moderate swelling on or around the incision site is abnormal, and may be an early sign of infection. For routine elective surgeries, any discharge from the incision site is abnormal. "NEVER PUT ANYTHING ON THE INCISION UNLESS YOU ARE SPECIFICALLY TOLD TO DO SO BY YOUR VETERINARIAN." NEVER PUT ANYTHING ON THE INCISION UNLESS YOU ARE SPECIFICALLY TOLD TO DO SO BY YOUR VETERINARIAN. Never put hydrogen peroxide or rubbing alcohol on the incision. These chemicals are toxic to healing tissues, and will cause inflammation and delay the surgical healing. Call your veterinary clinic if you observe any abnormalities or if you have any questions or concerns about your dog's progress. My dog keeps licking the incision. What should I do? We have various sizes of protective collars or "E-collars" (for further information, see our handout "Elizabethan collars") to keep your dog from licking the incision site. Licking often leads to chewing or removal of sutures, which can happen in a few seconds. Mild licking can result in an infection that requires antibiotic treatment. However, persistent licking can cause serious injury to the incision and may require a costly surgery to repair the damage. "Persistent licking can cause serious injury to the incision and may require a costly surgery." In general, your dog should gradually improve each day. If your dog's condition changes or suddenly worsens, please call us at the veterinary clinic as soon as possible. Your goal by following these post-operative instructions is to help your dog return to a normal and pain free life as soon as possible.